May 16, 2010: This post is a “back-dated” post. I originally wrote this in an email to family because I hadn’t started blogging. Some of the things mentioned most likely will come up in my blog posts, so I thought I would post them. 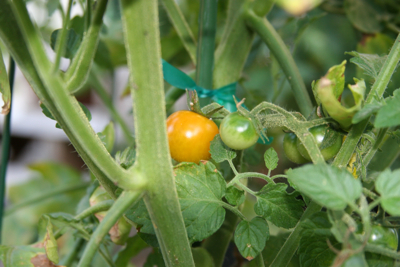 My first tomato is now orange (Sun Gold). Lots of little green tomatoes and I have several baby cucumbers, too.